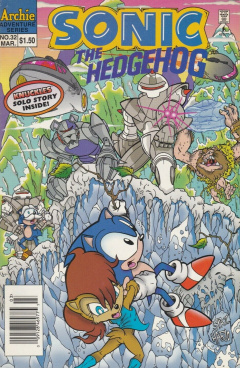 Sonic the Hedgehog 32 is the thirty-second issue of the Sonic the Hedgehog comic. This comic features two stories: Blast From the Past and Tundra Road. This issue also features the Knuckles' side-story Prisoners. The Freedom Fighters are on a cliffside, with Sally Acorn hanging down the edge of the cliff by a rope. A number of SWATbots arrive, ambushing the group. One fires at the rope holding Sally, sending her plummeting down the cliff. Tails flies in in the knick-of-time and grabs Sally from her freefall, all the while, the SWATbots continue to fire at the group on the cliff. Unsure as to how the SWATbots found them, they run back, but are approached by another SWATbot with a robodog. Sonic takes a closer look, and realizes that it isn't any robomutt...but rather Muttski, his dog. Bunnie walks over, curious as to how Sonic knows the dog. He recalls his life before Robotnik, where he loved Muttski, especially since Muttski saved his life once. The robotic Muttski pounces at Sonic, despite his attempts to call him off, hoping he'll recognize him. Suddenly, Muttski stops right in front of Sonic, but turns around and joins the other SWATbots, who all leave the area. Sonic tries to yell to Muttski to return back, but to no avail, as a figure in the shadows tells him to let Muttski go. Sonic turns around to see his Uncle Chuck, working a controller. Still able to access Robotnik's secret codes and equipment, he was able to call off Muttski and the SWATbots. Unfortunately, he has no way to get to Muttski's mind. Uncle Chuck also tells Sonic that since Muttski knows Sonic's scent the best, and that as long as the dog is roboticized, he will be a dangerous enemy. Antoine interrupts the two, afraid of the SWATbots returning. He turns around to start to leave, but tumbles off a small cliff instead. He hits another cliff wall that stops him, but as he opens his eyes, he sees an ice-preserved historic Mobian bear in the cliff. He yelps in fear, despite the lack of a threat. Soon, all the Freedom Fighters get down to Antoine's position and look at the preserved beast. Uncle Chuck figures that it is a Mobian Bear that was accidentally frozen many thousands of years prior, only to be revealed due to the SWATbot attack. Although Sonic has a bad feeling about the bear, Rotor thinks the opposite, arguing that the humane thing for them to do is to thaw the creature. In Rotor's lab, Rotor uses a glaciator device he captured from Robotnik to thaw the Mobian bear. Although the glaciator was made to make ice, he set it in reverse to allow a thawing process. Unfortunately, the process is not a quick one, as Rotor tells Sonic that it will take days for the full thaw to occur. Sonic, not wanting to get board, prepares to run off, but accidentally knocks into the glaciator, setting it into overdrive. It launches a large blast at the beast, thawing it quickly. Sonic apologizes, but Rotor notices the creature move it's eyes. It then tries to say something...then using it's wooden club to smash the glaciator. The two Mobians jump aside as the creature goes on a mad spree, flying out the lab's window and scaring Sally. Antoine summons up the courage to confront the beast, after seeing Sally nearly get hurt, but before he can do anything, Bunnie grabs the beast and puts him on top of a tree to cool down. The Freedom Fighters meet together to figure out what to do with the beast, that they have now named Mobie. They are all concerned about Mobie wreaking the village, but Rotor tries to reason with them, explaining that this whole situation is a shock to Mobie. He tells them to let Mobie wait a bit to adjust to the new environment to see a better side of him. Bunnie then recalls to when they first found Mobie, and that he was holding a paintbrush along with his club. Thinking that he is a cave painter, she develops an idea, and heads out for a bit. She returns with a paper showing Mobie holding hands with the Freedom Fighters and shows it to him, trying to show that they are friends. He grabs the paper and looks for a minute, remembering his old family. With that memory back, he hops of the tree, landing on Sonic, and runs off. Rotor thinks he's doing to return to his cave, but with the SWATbots near it, he could be roboticized. Despite what has happened prior, Sonic decides that he might as well go and help. Sonic runs around the mountain that they found Mobie, but despite going all over it, he is unable to find him. Finally, he locates him in a chasm, but he's surrounded by SWATbots. For ambushing him earlier, he decides to take out the SWATbots with a new move he has developed. He drops down into the chasm and starts spinning around upward, forming a tornado around him. Mobie watches as all the SWATbots are caught in Sonic's tornado and flown away. Sonic ends the attack, commending himself for his performance, but loses control of his motion from being dizzy, whacking his face into the chasm wall. He falls down and goes unconscious, just as Muttski arrives on the scene. Mobie, who is starting to escape the scene by climbing up the chasm wall, looks down to see Muttski treading toward the unconscious Sonic. He looks up and sees a protruding rock, which gives him an idea. He grabs a rope he had and lassos it around the rock. Muttski is now in a full run, about to attack Sonic. Mobie flies down, swinging on his rope, and grabs Sonic in the knick-of-time, causing Muttski to ram into the chasm wall. The two Mobians get off the rope, and Mobie prepares to finish off Muttski with a rock, but Sonic stops him. He tries to tell him why he wants him to stop in words, but Mobie doesn't understand. Taking a page from Bunnie, Sonic grabs a stick and starts drawing on the ground, showing that he loves Muttski. Now understanding, Mobie takes the offline Muttski and gives him to Sonic. Despite his thoughts of Mobie earlier, he now has an appreciation for the beast. Back at Knothole, Uncle Chuck is able to restore Muttski's consciousness, but not his body, making him good again. In regard to Mobie, Uncle Chuck also has an idea for him to adapt to the present society. He takes him to the Mobian Jungle, an area of Mobius not touched by Robotnik and too harsh for modern folks, a perfect environment for him. Mobie waves goodbye, so Sonic tells Muttski to sit up and give him his paw. Muttski takes this literally, and detaches his paw as Mobie shakes it. Sonic has a good laugh, while Mobie is dumbfounded. Continued from issue 31 and Knuckles' Chaotix. Mighty, Espio, Charmy and Vector all wake up. One moment, fighting for their lives from an unknown enemy, and now waking up in a dark room. An ominous voice is heard by all, telling Charmy that he has his reasons for bring them there. Espio starts to activate his camouflage, but the being tells him that it is not required, nor is Mighty's strength. He then reveals that once their "guest of honor" has arrived, everything will make sense. Vector looks up, noticing a camera in the room, noting to the being that he knows a lot about them and Knuckles. The being is happy that Vector can put information together, and 'tries' to put his mind at ease, stating that the problem they are in can easily be solved. Espio and Mighty turn around and notice a door open, revealing a hallway. They all exit the room, as the being tells them to turn the corner. They turn the corner in the hallway, as they come upon the being...Archimedes. Rotor, having heard a plea for help from his mother, headed up to his home in the north to aid them. Upon arriving, he found them all brainwashed by Robotnik. Trying to escape, he was attacked by an icebot and sent sinking into the sea. He eventually wakes up, finding himself on an ice flow. With a bump on his head and in a woozy state, he looks up to see Sealia, one of the displaced Arctic Mobians that he had helped saved some time back. She prepares some tea for Rotor as she explains her story. While she was fishing for dinner, she had noticed Rotor sinking into the sea. Using all her strength, she was able to get Rotor to the surface, but not easily due to his weight. Unable to get him on the ice flow, she had one of her arctic friends, Augustus, lift him onto the flow. Rotor thanks her, and wants to thank Augustus, as Sealia returns Rotor's hat to him. He tells her that he got the hat from his mom, then making him remember the original reason he came up to the Frozen North Sea. Rotor tells Sealia about what has happened to his family and that Robotnik wants to usher a new ice age on Mobius. He asks Sealia if she and her friends can help him, but most of the Arctic Mobians are living far away. Rotor starts to get frantic at Sealia, causing Augustus to appear to protect Sealia, lifting Rotor up with a belt. Sealia quickly walks over and tells Augustus to put him down. Rotor explains his story again to Augustus, thus convincing him that they should help. Sealia starts to think up a plan. Back at the walrus ice flow, Robotnik is called up on the monitor by the icebots. He asks what they want, as they reveal that the other creatures of the north have paid tribute to Robotnik with a creation: a giant wooden horse from the "Frozen Trojans". Robotnik recognizes it as a trap, but is too late, as Rotor, Augustus and Sealia burst out of the horse and attack the icebots. The three walk up to the monitor, threatening to destroy it, but Robotnik has another plan up his sleeve. He calls out to the brainwashed walruses in the room to destroy Rotor. They start marching toward him, repeating Robotnik's orders. Augustus grabs Rotor and leads him out of the ice flow's fortress, causing the walruses to leave as well. With them gone, Sealia gets to work on destroying the fortress. Augustus puts Rotor down at the edge of the flow, and tells him to wait there as he jumps in the water. Although Augustus tells him not to worry as he jumps in the water, Rotor can do nothing but worry as the walrus mob gets closer to him. Augustus, meanwhile, swims under the flow and breaks the ice, causing the walruses to be stranded on a small ice flow. Rotor can only watch as the walruses he knew are brainwashed, stuck on the flow, as Sealia blows up the fortress. With Robotnik unable to continue his plan, and the tide drifting his family away, Rotor can do nothing at the moment to help them. However, he throws an electronic tracer onto the flow so he can track them for later on. Later on, Rotor boards his submarine, leaving Augustus and Sealia behind. They pledge to keep an eye on the walruses and to radio information back to him. He prepares to returns to Knothole to figure out a way to break Robotnik's hypnotic spell on his family, intending to return one day. Muttski is introduced, although he was shown in a virtual reality simulation in issue 16. Antoine's trait of mixing similar-sounding words, from his SatAM counterpart, is first used in this issue. Sealia and Augustus were initially introduced in issue 26.